So when I first picked it up I thought – embarrassingly now – that perhaps it was something a bit pinniped-like but then the teeth didn’t match that idea at all so I reverted to thinking it was a bit more doggy. Irritatingly, it was a juvenile so that scuppered size-based guesses, and ruled out taking too much information from the posterior, mandibular teeth. Also, the skull was darn cute, with a shorter snout than an adult would possess. I had a couple of ideas from looking at the width of the zygomatic arches, but that lack of a parasagittal crest got me all twisted around. And time was tight for what we needed it for! We’ve discussed in the past how the skulls of juvenile animals can be misleading and for this species a number of the features you would immediately recognise in the adult are absent in this juvenile. Therefore I’m not that surprised the suggestions in included Arctic Fox, Sea Otter, Common Seal and Spectacled Bear, in addition to the possibility of Wolverine. Despite the juvenile dentition, the blade-like molar and 3rd premolar, and robust second molar were indicative of a carnivore with a specialisation for eating bone and the breadth across the zygomatic arches indicated something with a powerful bite force. Wolverine dentition is remarkably robust, since they often scavenge bone and in the winter they need to feed on meat that has frozen solid. They have a wide skull (see above), but the relatively large upper molar is at right angles to the 4th premolar, which has a cleft that the 3rd premolar nestles into. 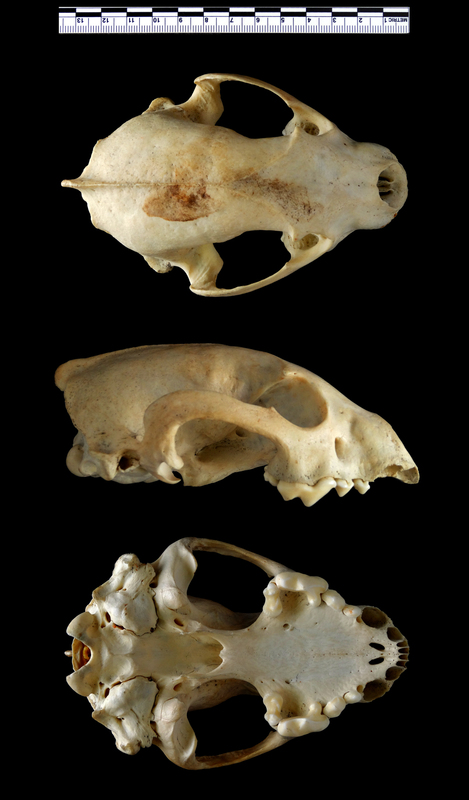 This is rather different to the much straighter dentition of the mystery animal, which is distinctly more cat-like, albeit with too many teeth. That narrows it down to one of the Hyenas. From there it becomes a bit more difficult and the fact it’s a juvenile throws a bit of a spanner in the works, but if pushed I’d probably opt for Spotted Hyaena Crocuta crocuta (Erxleben, 1777). So well done to Chris, Lena, palfreyman1414, Allen Hazen and henstridgesj who all came to the same conclusion. Finally, a big ‘thank you!’ to Nick for posing a decent challenge! wow, so interesting! C’mon next Friday!